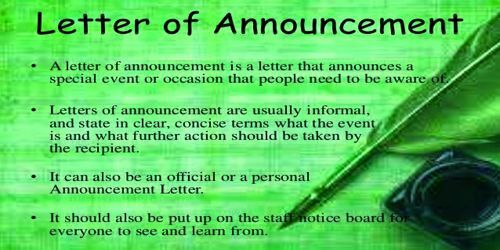 An announcement letter is a type of letter used for a number of business and personal situations. These letters are meant for a professional, formal setting. Announcements are made in response to several things like rumors, promotions, retirement, pregnancy, college graduation, engagement, baptism, wedding etc. Make an announcement related to any kind of an occasion or an event.